Pre-CPS Capcom PCB dead battery repair. The first thing to do is remove the battery, which is located close to the Kabuki chip, and throw it away (I reccommend flicking it). ***WARNING*** These batteries could contain lithium, which is an extremely volitile substance. If you puncture the battery, it will spray nasty liquid on you, your board and the surrounding area. In a matter of seconds, it will start eating whatever it landed on. Skin, PCB, clothes, eyes, whatever! That said, just be careful not to cut the battery off the board too close to the battery and you'll be fine. 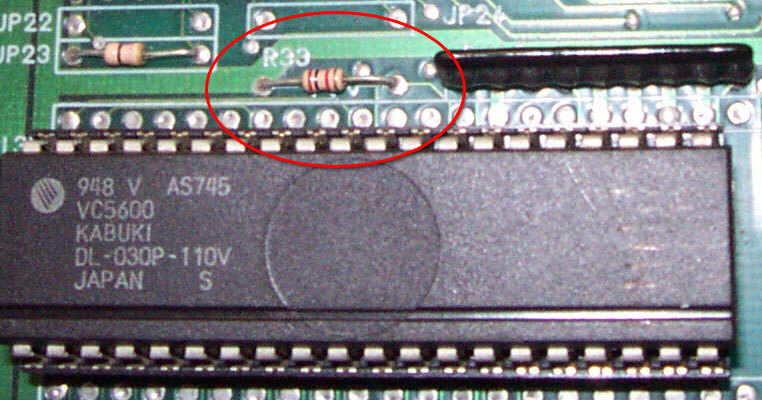 Next, remove the resistor at R33 shown here and jump the right of the two points the resistor used to connect to Ground as shown here. This makes the Kabuki behave like a normal Z80. Next you'll want to burn a 27C020 EPROM and a 27C512 EPROM with the correct data for your game. Choose the appropriate link below to download the correct file for your game. The following games are pretty obscure, so I haven't bothered making up a replacement ROM set for them. If you need one of these fixed, drop me a note and I'll make a set. 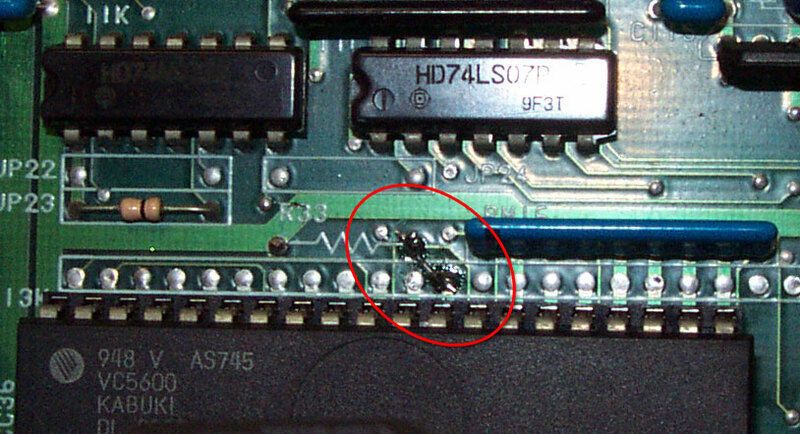 Once the new EPROMs are burnt, remove the 27256 EPROM at 11H and the 27C301 at 13H. On your newly burnt 27C512, pull up pin 1 so it won't go into the socket and plug it in. Also pull up pin 30 on the 27C020 and plug it in too. You'll notice that the two pins happen to touch. How nice. :-) Run a wire from those two touching pins to pin 27 on the Kabuki. If you're working on a game with a ROM at 14H, you'll need to burn a new ROM for 14H (also a 27C020), pull up pin 30 on that one and run a wire from pin 30 to pin 27 on the Kabuki as well. You'll need to check some jumpers to make sure OE and A16 aren't swapped for the ROM at 13H on your board (many are). The jumpers JP19 and JP21 need to be open (no jumper) and JP18 and JP20 need to be closed (jumped). See pic. (Thanks to Wolfgang Schrader for finding these jumpers.) If they're not set right, your game will sit at the "RAM OK" screen forever. The pre-JAMMA games (Poker Ladies, Block Block, etc. ), may not have these jumpers or the jumpers may be in a different location. I haven't looked. That's it! Put it all back together and your board should boot and play like new and you never have to worry about the stupid battery dying again! Yay! If your game now works but has some scrambled text, like the "Insert Coin" text on Buster Bros., you've burned the wrong version of the code for your game. People very commonly think they have a Buster Bros when they, in fact, have a Pang. Go back and re-burn the EPROMs with the correct code. If you're working on Super Pang or Super Buster Brothers, and the game now reports RAM OK, 8MHZ Original Board" but then goes blank and coins up but without graphics, you need to initialize the NVRAM. Do this by cutting off power, then turning it on while holding down player 1 start. Hold it down until you see the SUPER PANG, etc screen. If the game just sits there at the RAM OK screen and goes no further (it's not passing it's ROM test), you may have a version where Capcom used a non-JEDEC pinout EPROM. You need to set the jumpers to swap OE and A16 (pins 2 and 24) on the ROM at 13H. See above. The Kabuiki could be bad. Try a Z80B. Make sure it's a Z80B (you might want to undo the R33 jumper if using a normal Z80B). It could be a dead Z80. Try another. Something else other than a dead battery is wrong with your board. You're on your own. 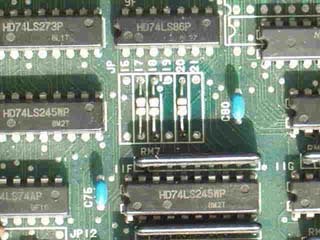 (Check for broken traces, verify you're getting the proper voltages, reseat and clean all socketed chips, try replacing the RAM).